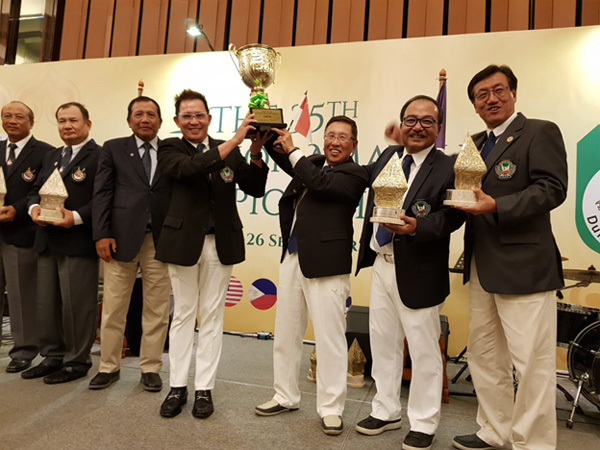 The 35th Asean Senior Amateur Golf Championships were hosted in Jakarta, Indonesia from 24 to 26 September 2018. Singapore Senior Golfers' Society which is part of the Confederation of Asean Senior Golfers Associations (CASGA) participated in the event with a team of 34 participants led by Senior Vice President Pang Boon Hee and our newly elected Captain Peter Koh Hock Guan. The team comprised members from the various Age groups in SSGS. The 3 days tournament was held at Rancamaya Golf & Country Club in Bogor & Pondok Indah Golf Club in South Jakarta, which was the venue for the recent 18th Asian Games in August 2018. The tournament was played over 3 days with the A Division players (Handicap 0 -18) in Stroke Play & the B Division players (Handicap 19 to 24) in Stableford play. There was a total of 256 participants from the 6 Senior Golfers' Associations from Brunei Darusallam, Malaysia, Philippines, Singapore, Thailand & host country Indonesia. 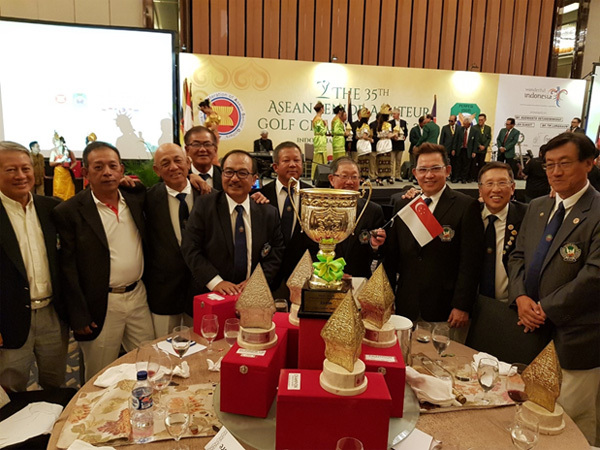 This annual event would strengthen ties among the ASEAN members' countries and promote greater cooperation among the golfers from these countries. After 3 days of golf in fine weather, the Overall Association Champion for the Lela Pahlawan Challenge Trophy went to Malaysia with a massive 48 points based on the total points scored for each event according to CASGA regulations. The Overall Team Gross Event for the Tun Sri HENRY H.S. LEE Challenge Trophy based on 3 days Gross score went to Malaysia with SINGAPORE winning the Best Nett Event for the ZAKIR CHALLENGE TROPHY from Thailand who was Runner Up. The Best Nett Team, led by Team Captain, Dicky Tan Ee Seng with James Fu Sze Kay, Lam Tih Kai & Daniel Lo Hock Peng gave their best showing with the total 3 days Nett scores of 631. Kudos to the team for bringing back the Zakir Challenge Trophy beating Thailand to the Runners Up position with 641. The Best Gross team did not fared not too well as the event clashed with the 29th Singapore Open Senior Amateur Championship held during the same period, resulting in most of the veteran stroke players did not join in the trip. The Stableford Team players fared reasonably well and won Individual medals in their respective Age Groups. The 37th Asean Senior Amateur Open Golf Championships would be hosted by Singapore Senior Golfers' Society in 2020. 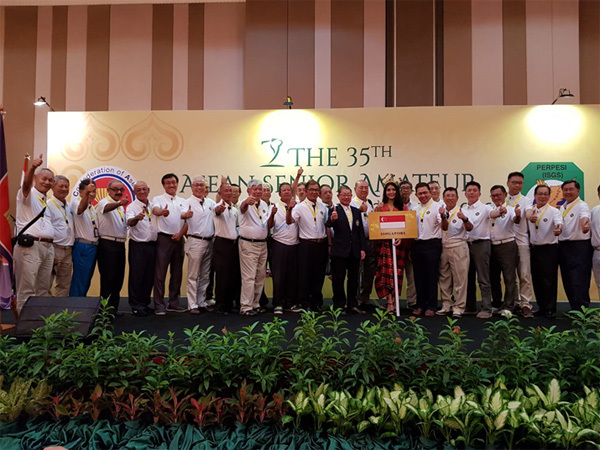 We would be looking forward to field a stronger Team for the 36th Asean Senior Amateur Open Golf Championship to be held in Kuala Lumpur in September 2019. L - R : Daniel Lo Hock Peng, Dicky Tan Ee Seng (Team Captain), Lam Tih Kai & James Fu Sze Kay. SSGS Team Members with the Zakir Challenge Trophy & prizes with Captain Peter Koh Hock Guan holding the Singapore flag.